It is said that we eat with our eyes first, but what if something is too pretty to eat? Such resistance to pulchritudinous pastry usually crumbles after a nanosecond as the desire to devour a divine delicacy drives a dessert fork right into the artfully crafted cake. California-based Satura Cakes banks on humans' tendency toward self-indulgence and on its cakes' strong appeal. Hours: Monday through Friday, 7 a.m. to 6 p.m. Hours: Monday through Thursday, 8 a.m. to 10 p.m.; Friday, 8 a.m. to 11 p.m.; Saturday, 9 a.m. to 11 p.m.; Sunday, 9 a.m. to 10 p.m.
"We think a high-calorie treat should be enjoyed in moderate quantities and should always be maddeningly pleasurable," says the company Web site. 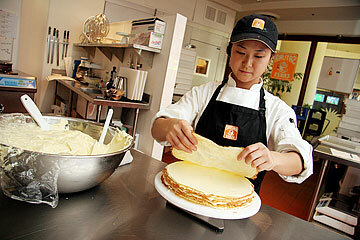 Satura Cakes founder Hironobu Tamaki, a Japanese-born businessman, transferred to his employers' Silicon Valley operation about 14 years ago. He found himself pining for the Japanese-style European cakes he enjoyed at home -- because he could find nothing to sate his craving. The longing burned a business plan into his brain. He returned to Japan after a few years where he enjoyed cakes, made a fortune with a golf Web site and plotted to build a bakery that would make maddeningly pleasurable cakes on U.S. soil. The funny thing is, Satura is not a Japanese word. Satura is a type of cake made during the Roman Empire, according to the company Web site. Satura Cakes was established by parent company Miyabi Foods Inc. in California in 2004 with a kitchen and two retail stores in Palo Alto and Los Altos. More locations are planned in California and perhaps in the Pacific Northwest. "Those people living on the West Coast are kind of, they have an understanding of international culture, of those things from outside America," Tamaki said. In December, Satura Cakes expanded to Hawaii with a kitchen and retail store at 55 Harbor Court. Its second location, at Ward Centre, opened last month and a third is to open next month at Royal Hawaiian Shopping Center. The rapid expansion is in accordance with the company's "cluster model," Tamaki said. "In each cluster there is one kitchen and we (can) serve five retail stores," so that the overhead of the kitchen will be spread among the stores. Satura Cakes may not need five locations in the Honolulu area, however, because of high foot traffic at the Royal Hawaiian Shopping Center. "I'm hearing from the people around the shopping center that each (chain) store does twice as much sales as the national average." Given the numbers, Tamaki wonders if the Harbor Court kitchen's capacity will be able to support five stores. "It may only support four," he said. Such a hub-and-spoke model has worked fairly well for other businesses. "I suppose Sears' corporate buying office decides that every Sears store should get some quota of snowblowing machines," except, perhaps for Hawaii stores, said Charles Steilen, dean of the College of Business Administration at Hawaii Pacific University. FedEx has hubs and spokes for receipt and distribution and commercial airlines also have hubs, he said. The key function is the centralized distribution system from which a business "can easily go ahead and shoot (product) out to other places," Steilen said. Satura Cakes generally makes one daily delivery to its stores each morning, but "depending on the sales of that day we may have to make a second delivery in the afternoon, Tamaki said. Hours of the stores vary, depending on location. In Palo Alto, college students are out late so the shop stays open until 10 p.m. on weekdays and 11 p.m. on Saturday. The Los Altos location is in a residential area so it closes at 8 p.m. Expansion to Hawaii seemed a difficult task, "but one of our founding members sternly advised that we cannot miss this opportunity in Hawaii," Tamaki said. The Japanese visitor market and strong Hawaii economy factored in to the decision. The locations that Miyabi Foods reviewed also bore a comforting similarity to affluent areas in California. The Harbor Court location is in the bustling downtown business district; Ward Centre draws visitors and local shoppers and has nearby upscale high-rises already built with more on the way; and the visitor vortex that is Waikiki goes without saying. Tamaki and the company's board of directors are aware that the tourism fluctuates, so "we are looking at different markets and different demographics," he said. The next Satura Cakes location could be in Kahala, populated largely by the well-heeled. All of Hawaii's specialty bakeries could be seen as Satura Cakes' competitors -- the closest of which would likely be Patisserie La Palme D'or, which opened in the old J.C. Penney space at Ala Moana Center in June. 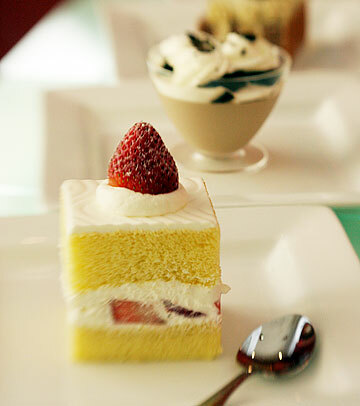 It, too, sells Japanese-style European cakes and pastries made with ingredients from Japan. "Business is going very well so far," said employee David Umeno. Most of the shops' customers are visitors from Japan. "We do get locals in, but I'd say one in four (customers) are locals," he said. Patisserie La Palme D'or is a sister operation of a full-service restaurant in Japan. Many Hawaii bakeries with niche markets have been successful, observed Gail Ann Chew, executive director of the Hawaii Restaurant Association. "What all these outlets showcase to me is that their customers, whether local or a visiting customer, people are looking for high-quality, great taste, fresh products and the presentation." It can be seen at restaurants, as well. For instance, Chew said, "when you visit the counter at Alan Wong's Pineapple Room and see his baked goods. And you see it at Kakaako Kitchen, where Russell (Siu) not only has his regular counter for food service, but right next to it are all the wonderful baked goods. "We all have our sweet tooth and all of these folks just make the most wonderful, delicious items. The thing about each of them is that they are unique." 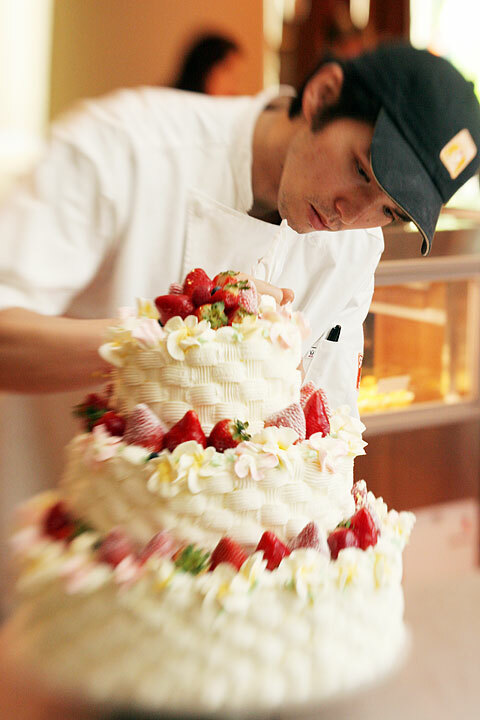 Tamaki believes that even in an economic downturn, luxury items such as artisinal cakes will survive. "It seems like people cannot go back, once they get used to a quality product," he said. "It's like Starbucks. People used to pay only 99 cents for a cup of coffee, but they now pay $2.75 for a cup of latte," Tamaki said. "What I've been telling employees here, is that just the way Starbucks changed the way people drink coffee, we will change the way people eat cakes," he said. Satura Cakes also serves gourmet coffees and teas. Beyond individual servings of self-indulgence made with real butter and no hydrogenated anything, Satura Cakes does wedding cakes and is getting into the wholesale end of the wedding business. It has partnered with Watabe Wedding Corp. and plans to seek other alliances to provide wedding cakes, whether the couples are local, from Japan, the mainland, or wherever. "In any case, our customers will be those hotels or some other wedding planners," Tamaki said. Satura Cakes has garnered some attention from Japanese media, who notice right away the Nihonjin is running a very American company. "They are surprised to see how American this company is," he said. While working in Silicon Valley for a huge Japanese trading company, senior management was all Japanese and Americans could not break through the glass ceiling. "I didn't want to create a company like that," he said. "I believed in the potential and the possibilities of this company, so I thought, for the company to be very successful in America ... it has to be structured in a very American way." In addition to mainland and local expansion, Tamaki plans to go West -- to take his Japanese-style European cakes home to Japan. "It's like the restaurant Nobu," established by celebrity chef Nobu Matsuhisa and investors such as Robert DeNiro. "They started in the U.S., opened a restaurant in Japan, in Tokyo, and they're very successful," Tamaki said. "My plan is to open the first shop in Japan in two years, when I think we will have established our brand name in the United States."